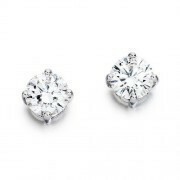 Diamond Solitaire Earrings	There are 50 products. Diamond solitaire earrings, perfectly matched and of exceptional quality, with an average colour grade of F-G and VS clarity, ensuring you get the finest quality earrings at just a fraction of the high street price. Classic diamond stud earrings are highly desirable and will never go out of style. All of our diamond stud earrings are in stock and available to view in our Edinburgh showroom. Pair of 18ct gold claw set round brilliant cut diamond solitaire stud earrings. Total diamond weight 0.38cts. White gold claws with yellow gold post and scroll fittings on the rear. Also available with 18ct white gold backs and in platinum in a variety of diamond weights. Please contact us for details.